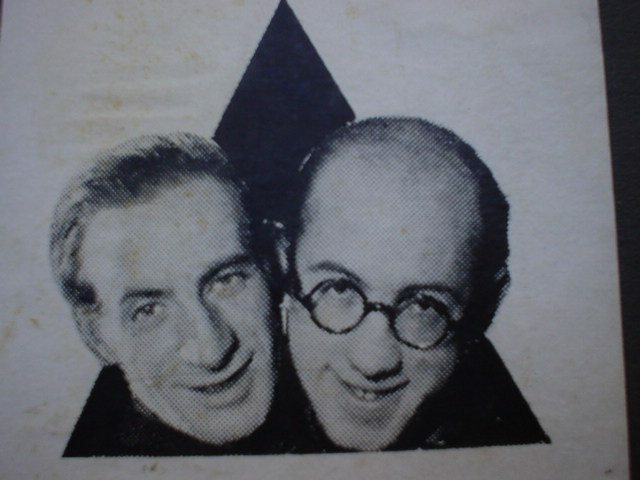 The comedy duo Dzigan and Schumacher was for three decades the most successful pair on the Jewish-Yiddish stage, more than any other comedian or ensemble. Their story is also the story of Jewish entertainment, and also the historical story of the Jewish people in the 20th century. Their repertoire included dozens of acts in Yiddish, and a few in Hebrew, that evoked cultural changes in the Jewish world in Europe and in the young State of Israel like no other duo had. After their split and Schumacher’s death, Dzigan went on performing on his own for 20 more years. Born in Lodz, Poland, Simon Dzigan (1906) and Israel Schumacher (1908) were influenced by the growing Yiddish theater since their childhood. They shared the same background, as well the strong conviction that as Jews they were committed to preserve the Yiddish language and also the Socialist agenda that was spreading after WWI. In the mid 1920’s they joined a small group of Jewish actors in Lodz, and founded together a performers collective called Ararat. Dr. Diego Rotman explains in his study that this name symbolized a new fresh beginning. All members in the pioneering Ararat group were young Jewish Socialists filled with revolutionary enthusiasm, and their sketches reflected this agenda. Ararat’s materials, with the vigorous actors, high energies and loads of makeup and impressive costumes, did not resemble any of the old Yiddish plays. In the 1930’s, Ararat moved to Warsaw with a new repertoire. Dzigan and Schumacher started to stand out and soon began to perform just the two of them. Their acts were inspired by other popular comic dous, for example the films of Laurel and Hardy who were a cinematic blockbuster. Every comic duo is based on the contradiction between the two characters. Dzigan was the serious and educated one, whereas Schumacher was a rude, ignorant anarchist, The comic effect was usually achieved by Schumacher getting furious at Dzigan for not behaving properly. Off stage, there was some correlation between the characters they played the actual real personality. Schumacher was indeed the more reasonable man, a family man, a strict actor who aspired to do some serious acting, not just comedy. Dzigan was lazy, easy going, absent minded with little respect to scheduled appointments, and certainly was not a respected family man like his partner. They gradually stood out in Ararat, but the crucial change occurred at the eve of WW2. The group pointed its satire against the Polish government on the one hand, and against Nazi Germany on the other hand. After the Nazis invaded Poland, Dzigan and Schumacher and the Ararat fellows escaped together to the U.S.S.R. and in 1941, when the Nazis invaded Russia as well, the group split for good. Dzigan and Schumacher joined the Anders’ Army, an ally of Russia which had many Jewish soldiers. They tried to plan an escape route from Europe but were arrested by Polish soldiers as defectors. In interviews they gave years later, they suggested that the Polish were angry with them for their popular satirical acts that used to make fun of the flaccid Polish government during the 1930’s. Until the end of the war, Dzigan and Schumacher were imprisoned by the Soviets in Gulags. After the war they managed to get back together again and started to perform across Poland for a Jewish audience of refugees, and were once again loved and popular. They were stars of the film אונדזערע קינדער (Our Children), the last Yiddish film shot in Poland. In the late 1940’s they went on a tour which made them officially the most successful Jewish duo in Europe. Apparently their secret was using current news, they knew how to update their jokes based on what was happening to Jews in Europe after the war, combined with all kinds of family situations not related to current affairs. After the foundation of the State of Israel, Dzigan and Schumacher wondered whether viewers in Israel would like them. Indeed, the young state had a demand for Yiddish entertainment, and they had fans in Israel who knew their sketches by heart. 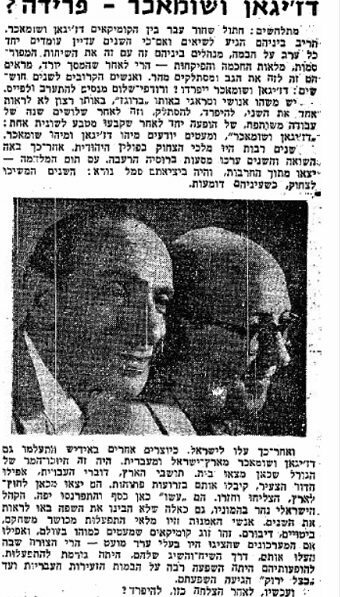 However an unpredictable difficulty arose: as part of the aspiration to form a new Israeli Hebrew speaking society, the government banned Yiddish plays by local citizens, and although Dzigan and Schumacher were not Israeli citizens, by 1950 they too were not allowed to perform in Israel. However since they were already famous, many media and culture figures started to press the government to change the stern regulation and allow them to perform. Thus, thanks to their popularity they managed to actually change government policy. First there was a condition that at least a third of their act is in Hebrew. Then Ephraim Kishon wrote for them a sketch called “The Intensive Ulpan” – the original script of the sketch in Kishon’s hand writing is displayed in the exhibition “Let There Be Laughter – Jewish Humor Around the World” at the Museum of the Jewish People at Beit Hatfutsot. 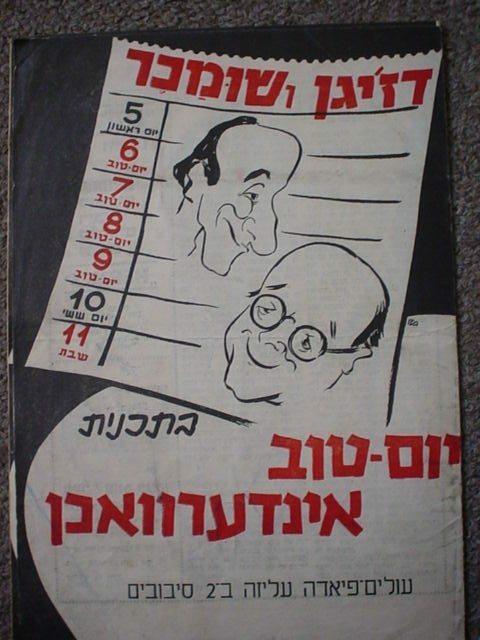 Some of the materials written by Kishon for Dzigan and Schumacher were later adapted and used by the Israeli famous trio “HaGashash Hachiver”, and became loved and known by the general non Yiddish speaking Israeli audience. 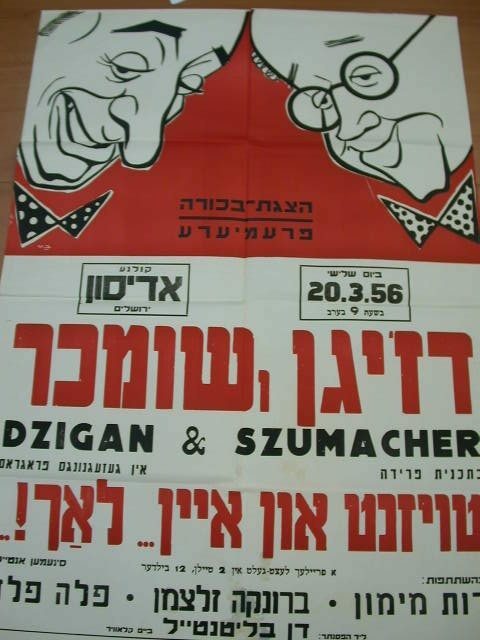 The Yiddish restriction was cancelled in 1958 but it was already too late for Dzigan and Schumacher. Though they gained popularity even among new none traditional audiences, in the mid 1950’s they started to quarrel. It is kind of sad, that when they were finally legitimized in Israel, they could not stand each other no more, and in 1960 they split. Schumacher tried to fulfill his longtime dream to become a dramatic actor, but failed, and after a year he died of an illness at a young age. Unfortunately, he did not live to enjoy the acknowledgment from the Israeli establishment. His daughter, Lidia, married the legendary actor and comedian, Shaike Ophir. Dzigan kept on giving satirical acts in Yiddish, but had to cope with a new generation of viewers. One time he performed for soldiers in 1967 and the clapped and clapped – but just in order to make him step off the stage, as they were bored and did not get his jokes. Still, he did live to enjoy public respect for his life work and for preserving the Yiddish and its crucial role in forming Israeli culture and satire. He worked and performed until his death in 1980 and even participated in T.V. Shows and specials. Our exhibition “Let There Be Laughter – Jewish Humor around the World” will open in 29.3, displaying, among others, Dzigan and Schumacher.